Nearly 60% of respondents see no reason to reinvent the wheel. Facebook is fine for something like this, so why would a church invest its resources in a new social system? Another 23% are teeter-tottering. You might fall in with the majority who believe it’s misguided, but if people would really use it, then perhaps it’s something you can get behind. Finally, we get to the group of you who are strong believers in a church-specific solution. 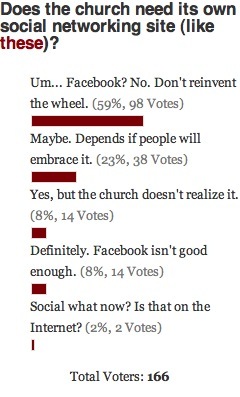 That group makes up 16% of folks who responded to our poll—half who say the church needs it but doesn’t realize it, and half who say it’s time to move this direction. Oh, and 2% of you wouldn’t know a social network from an ice cream social, so you don’t feel qualified to answer. Personally, when I think of the types of things a body of believers might want to share with one another and help one another with, I’m inclined to think something like this could be helpful. Why not allow for people to have openness and privacy among their fellow churchgoers without broadcasting to the world via Facebook? But the idea can’t become successful without widespread adoption, and I’m very confident it’s not the right solution for all churches. Only time will tell if it turns out to be helpful for some. This week, visit our home page and vote: What do you think of a mission trip for creatives? I think we’ll continue to see growth in the area of church social media platforms. I’ve been a fan of Yammer for quote some time, and that service is practically a clone of twitter/facebook but made private for corporate use. The benefits yammer offers over twitter/facebook are pretty substantial, and I think we’ll start to see churches recognizing that as well with services like tableproject.org and other church targeted sites. I’m a new transplant to my town, just started to get involved in a church over the past several months. I have exactly zero fb/twitter friends from that church so far. I just don’t know enough people yet. If they were using a churchwide social network I would be REALLY quick to jump on that and start making connections. Heck, it would probably have really swayed my opinion on what church to pick if I knew they had a service like that. So, you guys are always saying, “how can we reach the unchurched? how can we reach the unchurched?” But there’s a large group who think churches need their own social networking site? At the risk of sounding hostile, here’s a good idea: try turning off GodTube and going to sites that the unchurched (and the rest of the world) actually visit. I really don’t see the point of church specific social media – why use the time and resources to create something that is a social network for the strongest network in history (the church). As the church, we should be focused on those that are not in our church in terms of offering support and if we are supposed to br private about our beliefs in public forums, I must have misread something (please dont think that I am a radical but I am also not ashamed for my relationship with Jesus). Our support for each other in a public forum will show the lost that the church is a real social network with a purpose and that we care for each other – inside the church and not. I don’t think that there is a problem with the “network” of the church…when was the last time that someone that was in a church died and no one showed up, or was sick and no one prayed. Let’s use the social media and our love as the church to show those that don’t believe that there not only is a God but that he loves us and loves them – that will not happen if we go into the corner and have our own little party and leave them out! I think more churches and church leaders have to encourage their members (Christians) to start being bold and living their faith in all they do. Stop being shy or politically correct about your faith. Live it, share it, and be genuinely you online and offline. And the background for this poll is of course our interview with Jason Wenell of the Table Project. Jason and the folks behind So Church, the City and others would argue that church social networks have a place. I’d encourage folks to read that interview. The bottom line for us is, no one in the church is going to want to log in to “one more thing” – another user name and password – to do the same thing they do now on Facebook. Yes, these church social sites have better ways to do some things, and a more church-centric philosophy, but in our case, convenience wins out over purpose. Now, what should be going on is the development of a Facebook app that can overlay the church onto someone’s Facebook… who’s online in your small group, what needs from your Facebook friends you can meet, etc., so they can get all they need from these church sites, while staying on the framework of Facebook. I think this is a great conversation. I don’t think this in any way should be a replacement for churches and people using social media. I find GodTube a very different example than something like this. GodTube is a publicly available alternative to YouTube specifically intended to segment Christians. But having a network tailored to the needs of churches is pretty appealing to me. (Disclaimer: I’m not part of a large-enough church to possibly need something like this.) I think for some churches, the way they communicate amongst members and to non-members is different. Not disingenuous, just different. And for many people, there isn’t enough overlap between their online community and their church community to fully engage in their church community in such a broadcast medium. I know I find myself in this camp. I would feel I were spamming my Twitter followers if I used Twitter to engage with my church constantly. I am a member of technology driven church called genesischurch.tv (the church is actuality named for the website!) and we find social media incredibly useful in reaching people and connecting within the community, particularly through facebook. We’re all over facebook and it works! For info, outreach, organization. I love it. We don’t believe in segregating ourselves so far from the rest of the world that we’re not in relationship with unbelievers anymore. That’s a big reason why we’re about to launch church in a club, right here in Tallahassee at a popular club downtown. It starts Sunday, March 27th! Check out more info at http://www.theclubchurch.com!